Dylan Brown, Kevin Hauck, and Trenton Roetto. Republic has honored two of the leaders on its history-making 2017 soccer team. 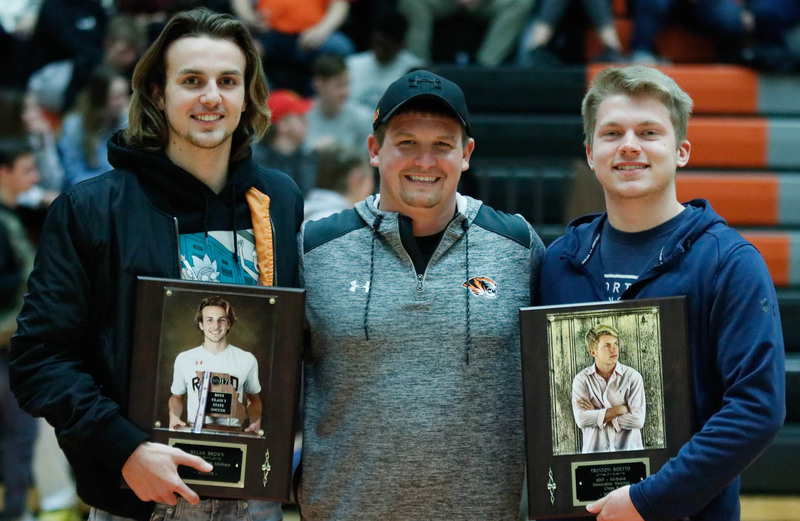 Dylan Brown and Trenton Roetto both received plaques during halftime of a recent basketball game that will hang alongside plaques for other all-state performers from Republic’s history. Roetto and Brown were key performers on the first Republic soccer team to reach the state final four. 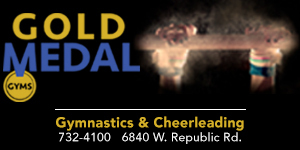 Roetto was a four-year starter at Republic. As a captain on the 2017 team, he earned first-team All-District, first-team All-Conference, and Class 3 All-State Honorable Mention. He was also a member of the Class 3 All-Region team. Roetto scored the game-tying goal in the state third-place game, which Republic would go on to win. According to coach Kevin Hauck, Roetto’s biggest contributions were his defense and ability to control the midfield in a commanding fashion, in addition to his work ethic and leadership. Brown was a first-team All-District and All-Conference selection in both 2016 and 2017. As a captain on the 2017 team, he was also All-Region Player of the Year, and became the first player in Republic boys soccer history to be selected First Team All-State. Brown holds Republic’s records for goals in a season (56) and a career (107). His 56 goals in 2017 rank sixth all-time in Missouri, and his 121 points that season rank seventh all-time. His career points (237) are seventh all-time in Missouri, and his points per game (3.38) rank second all-time. He scored the game-winning goal late in the state quarterfinal against Glendale to send Republic to its first final four, and he also scored the game-winner in the state third-place game.